Responsible Gaming is a central element in IGT’s sustainability strategy. As an end-to-end gaming company we create and manage Responsible Gaming programs that have a direct impact on the player. 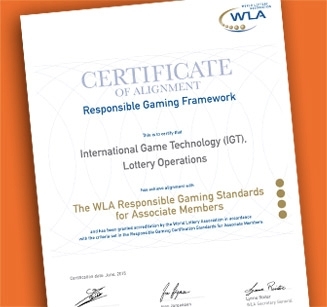 In July 2015, IGT was recognized by the World Lottery Association (WLA) as an industry leader in corporate social responsibility and Responsible Gaming, and received the organization’s inaugural vendor/supplier certification for our lottery operations. Our Responsible Gaming product features and consumer protection programs consider all elements of a gaming operation. We offer technologies that facilitate informed choices for the player, and improve consumer protection through age control, customer relationship management, and analytics features. IGT actively supports agencies and programs committed to research, prevention, and treatment of problem gaming. We collaborate with the World Lottery Association, the North American Association of State and Provincial Lotteries, European Lotteries, the National Council on Problem Gambling and the National Center for Responsible Gaming, and the European Association Studies of Gambling. Additionally, IGT and its subsidiaries support and participate in the activities of many regional and global organizations with a Responsible Gaming-related mandate. To learn more about IGT’s commitment to Responsible Gaming and Consumer Protection, please click here.